An international team of researchers from Empa, the Max Planck Institute for Polymer Research in Mainz and the University of California at Berkeley has succeeded in growing graphene ribbons exactly nine atoms wide with a regular armchair edge from precursor molecules. The specially prepared molecules are evaporated in an ultra-high vacuum for this purpose. After several process steps, they are put on a gold base to form the desired nanoribbons of about one nanometer in width and up to 50 nanometers in length. These structures have a relatively large and, most importantly, precisely defined energy gap. 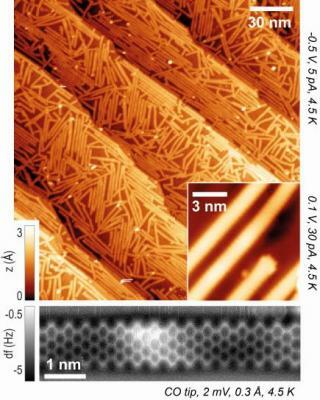 This enabled the researchers to go one step further and integrate the graphene ribbons into nanotransistors. Initially, however, the first attempts were not so successful: Measurements showed that the difference in the current flow between the "ON" state (i.e. with applied voltage) and the "OFF" state (without applied voltage) was far too small. The problem was the dielectric layer of silicon oxide, which connects the semiconducting layers to the electrical switch contact. In order to have the desired properties, it needed to be 50 nanometers thick, which in turn influenced the behavior of the electrons. In March 2016, researchers from Empa, the Max Planck Institute in Mainz and the Technical University of Dresden have succeeded, for the first time, in producing graphene nanoribbons (GNRs) with perfect zigzag edges from molecules.